▶ MongoDB CTO's Chicago Keynote — MongoDB CTO and co-founder Eliot Horowitz explains why MongoDB is the best database for modern applications, how MongoDB is evolving, and where Atlas and Stitch fit into the big picture. Time Series Data Schema Design Best Practices — Last week, we linked to the introduction to this series in working with time series data with MongoDB. This time we see how different schema designs can impact memory and disk usage. 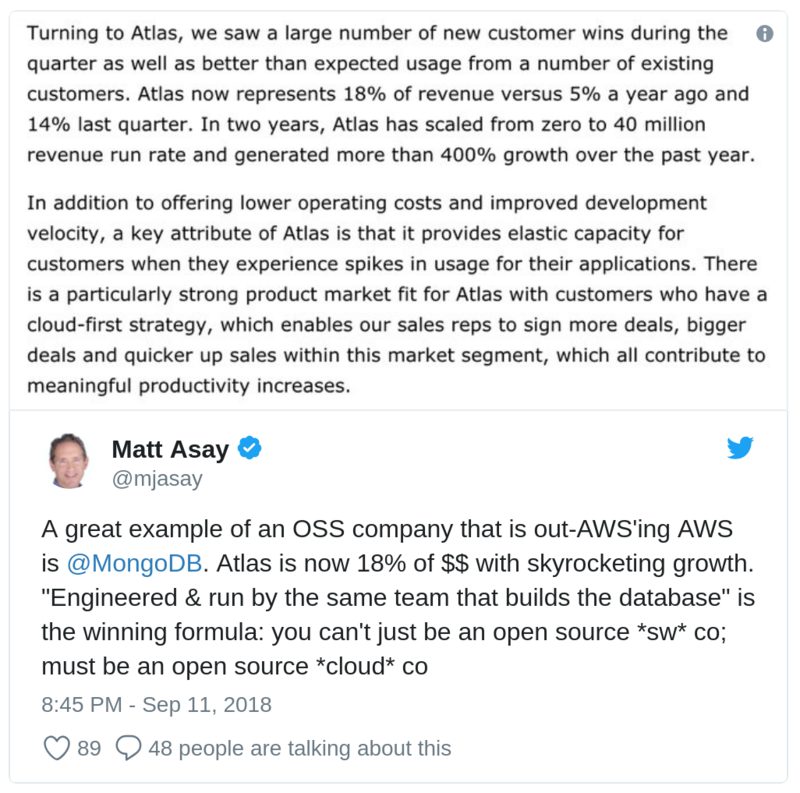 Exploring the Data Explorer in MongoDB Atlas — MongoDB Atlas has enabled the Data Explorer feature across all tiers including the free (M0) tier and tiers M2 and M5. MongoDB Takes On The World — Martin Heller reviews the latest version of MongoDB, 4.0. Recording Sensor Data with MongoDB Stitch and Electric Imp — Electric Imp devices provide a great way to get into the world of IoT. Handling Files using MongoDB Stitch and AWS S3 — Rather than dumping large files into MongoDB (which you can do, depending on the situation) you can store them on S3 and keep a reference in MongoDB instead. Controlling Humidity with a MongoDB Stitch HTTP Service and IFTTT — IFTTT is a popular service for connecting together other online services, and here we get to see how to invoke an IFTTT webhook that controls a dehumidifier from a MongoDB Stitch function. Mongoid: Ruby ODM Framework for MongoDB — Release 7.0.2 has just come out. MongoDB.local DC – October 4 (Washington, DC) — Experience a full day of deep-dive technical sessions, one-on-one consulting with MongoDB experts, and learn what’s new in MongoDB 4.0.